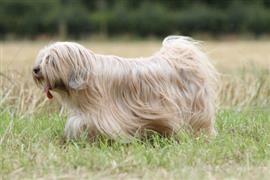 Many dogs are blessed with a magnificent coat of hair to keep them warm. When they shed, the vacuum cleaner quivers. New owners will soon learn both the ups and downs of their hairy companions. Before getting out the FURminator it is time to decide on a name. We have put together a list of ideas all related to a dog's coat. If your new puppy looks like Cousin Itt in the making, you will find these names quite accurate. One of the biggest sources of hair-themed names are words related to fibrous growths. Bristle, Brow, Lock, and Strand are a few befitting options. Other favorites come from famous people. Shaggy, Badu, Dolly, and Shakira are all big names associated with big hair. Another way to come up with ideas is to examine the local salon. Many hair products, styles, and techniques can easily be molded into a fitting name. Additional options can be taken from different types of carpet. Saxony, Frieze, and Berber are a few that cover the floor. Some of our pages will contain a subcategory. A subcategory is a slightly more specific grouping than the main topic of the page. For a subcategory, we will include a separated table of names and corresponding descriptions. An example of a subcategory of Red Dog Names would be 'Dog Names Inspired by Red Wines'. If you have any subcategory ideas for the Hairy Dog Names page, we would love to hear them. Use the form below to submit your ideas.